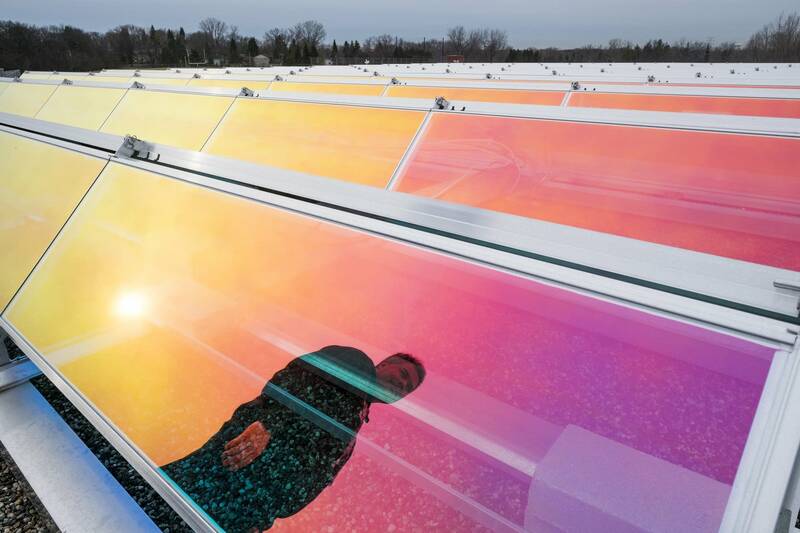 Mounds View High School's flat roof sports a colorful solar array capable of reducing the school's electricity costs and giving students a real-world learning experience. "Look at the solar through the course of the day and see how that peaks and see if there's any correlation at all with cosmic ray collection data," teacher Mike Cartwright suggested to one of his physics students recently. In just a couple clicks on the computer, Cartwright can pull up data on how much energy the panels are producing at a given time. Meanwhile, the school district expects to save $1 million on its utility bills in the next 25 years from six different solar projects scattered throughout the north-metro district. "It's a no-lose for the school district," Cartwright said. "We're collecting energy, we're doing carbon offsets, we can use it educationally, and it's good public relations." 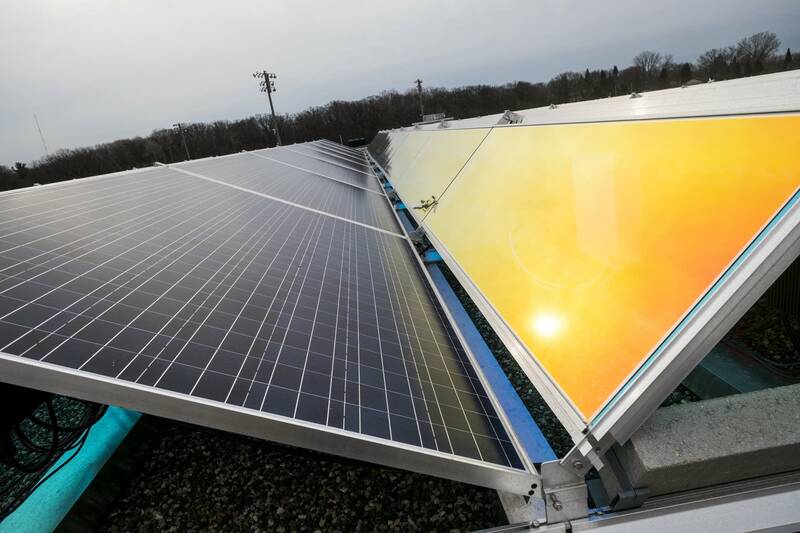 The school district doesn't own the solar arrays — Innovative Power Systems of Roseville does. The company pays the upfront and maintenance costs, then sells the power to the school district at a discounted rate. Solar panels are becoming a common sight on school rooftops. The list includes Farmington, Waconia, Cohasset, Red Wing, Forest Lake, Becker, Chisago City, Willmar and more. Some districts are set up like Mounds View. Others serve as a community solar site and receive lease payments. And some have chosen to subscribe to an off-site solar garden. But these kinds of opportunities are rare outside of Xcel Energy territory, where state policies have contributed to major growth in solar. Innovative Power Systems, which has a solar schools program, gets many calls from school districts interested in solar. If the school district is a member of a rural electric cooperative, it doesn't work the same way, said Eric Pasi, business development director. "They may be only three or five miles away from Xcel power lines, but can't access the same programs as their neighboring school districts," Pasi said. "There's a disparity between certain communities due to the utility that serves them." The reasons for the disparity are complicated, and they vary. One example of a school district that's struggled to add solar is New London-Spicer in west-central Minnesota. The district's superintendent, Paul Carlson, was one of many rural Minnesotans weighing in on obscure language being debated at the Legislature this session affecting rural electric cooperative utilities. Some rural Minnesotans were saying their utilities' fees and rules were making it tough to add wind or solar energy. And the rural utilities were concerned about mounting legal fees associated with defending their position before state regulators. Gov. Mark Dayton vetoed the legislation, which would have sent disputes to a mediator rather than the Minnesota Public Utilities Commission, but some lawmakers hope it makes it back into the final budget bills. Carlson's story starts with a long list of environmental projects students have done as part of Youth Energy Summit, an organization that brings renewable energy and conservation projects to rural Minnesota communities. New London-Spicer was the first Minnesota public school system to add milk dispensers to cut down on waste, Carlson said. Students also grow lettuce for the cafeteria in a passive solar greenhouse on campus. 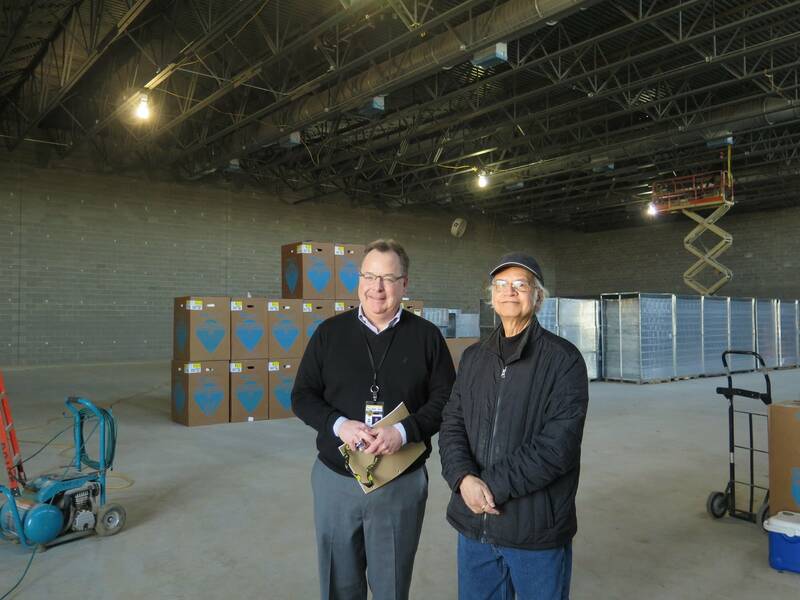 But what they want more than anything is to add solar panels on top of the new gymnasium, which is part of a $21 million bond referendum approved in 2015. "The first day after the referendum passed, kids were in my office: 'How big of a system can we put on with additional space?'" Carlson said. "We hope that in the future, all of the energy we consume here at school is renewable." Carlson said rooftop solar will help create new learning opportunities for students. And reduce electric bills. "Lower class sizes, individualized instruction and all the initiatives that cost money for districts, we can focus on that instead of spending $23,000 to $24,000 a month just on electricity," he said. But New London-Spicer's quest for solar hasn't been easy, and it still isn't resolved. The school district wanted its utility, Kandiyohi Power Cooperative, to buy back excess solar power. But the co-op's rules would only allow the district to sell a small amount back to the grid. Kandiyohi Power's CEO Scott Froemming said the rural co-op is a lot different from Xcel Energy. In rural areas, it costs more to deliver the power, because fewer people are spread out over a larger area, requiring more lines and poles. In addition, many electric co-ops are invested in coal-fired power plants, and they're still making payments on those. Co-op members are helping with those payments through their monthly electric bills. Froemming said if demand for electricity goes down for customers installing their own sources of energy, it changes how the overall costs of the co-op need to be distributed. "That's why we have the operating rules that we have — to try to balance the needs of all our members and try to be fair to all of them," he said. "We have to be able to look our neighbors in the face and tell them we're doing the best we can for them." At this point, there's no obvious solution that would benefit both the school district and the utility. "We want to keep the dialogue going with them," Froemming said. Carlson said he's come to appreciate the challenges rural co-ops face amid the transition toward more renewable energy sources — co-ops produce very little of their own power and rely on agreements with bigger cooperatives. "Their hands are tied," Carlson said. "We hope that those barriers can come down."